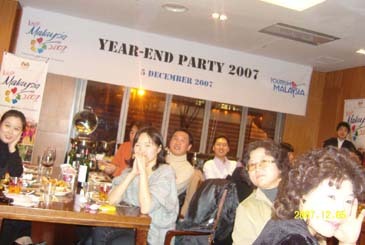 Director Abdul Mutalib Awang of Malaysia Tourism Promotion Board (MTPB) in Korea hosted a year-end party in Seoul on Dec. 5, 2007. More than 200 invited guests from local travel trade business community and news media representatives joined the friendly get-together as the year 2007 drawing to a close. "I really wish that every one of you would have achieved most or even closer to what you have desired or planned the year before," said Mr. Mr.Abdul Mutalib Awang in his speech. Describing the year 2007 as a memorable and eventful year, he said that Tourism Malaysia Seoul has achieved and accomplished some of its targets that was set the year before. In terms of Korean arrivals into Malaysia, Mr.Abdul Awang went on to say that 167,00 Koreans visited Malaysia during the first nine months of 2007, up 21 % from the same period a year earlier. He observed that the final tally for the year 2007 is likely to end up in the neighborhood of 235,000. Mr.Abdul Mutalib Awang maintained that the greatest achievement for this year is the improvement of market awareness, among others. "Kinabalu has become a prime and top mind destination for Koreans to Malaysia follows by other leisure destinations such as Penang and Langkawi," he said. In the meantime, other product segments such as Malaysia My Second Home Program and education tourism are getting popular in the market with more emphasis and efforts have been placed to promote these segments, according to Mr.Abdul Mutalib Awang . "All these promotions were geared towards the promotion of Visit Malaysia Year 2007," he stressed disclosing that his office's objective for the year 2008 is to achieve 300,000 visitor arrivals from Korea and to increase length of stay and tourism revenue by 10 %. To this end, he went on to say that more efforts will be made to develop new market like Sarawak and East Coast of Peninsula Malaysia, enhancing attractiveness and benefits on niche products such as education and MM2H. When asked to comment on the recent reports that Malaysia would extend the Visit Malaysia Year campaign until Aug 31, 2008, he said that Tourism Malaysia is geared up for attracting more tourists to come and target for next year is 21.6 million tourists. During the first nine months of 2007, 16 million tourists came to Malaysia and Malaysia is expected to achieve more than 20.1 million this year, according to the latest statistics. 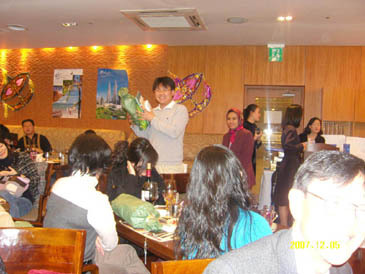 During the year-end buffet dinner which was followed by lucky draw, MTPB Director Awang also explained in details what his country is doing to make Malaysia a perfect leisure destination for South Korean people during the year 2008. "We also plan to have other new initiatives in 2008 such as re-branding of Kuala Lumpur, joint promotions with neighboring countries like Singapore and Brunei, strengthening partnership with ASEAN countries under ASEAN Promotional Committee for Tourism and so forth," he said pointing out that Korea's outbound travel market is considered as one of the world's most explosive in term of growth. Korea has a very sound outbound growth with an expected 14 million outbound travelers in 2008, he said disclosing his office's aggressive promotional campaign plans through TV, radio, print media and on-line promotion. 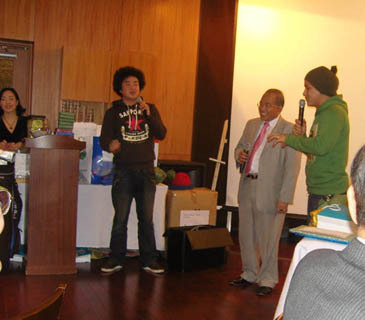 During the year-end gathering, a variety of tasty Malaysian dishes, music and other entertainment programs including lucky draws were offered to the enjoyment of the guests who braved chilly weather to join the year-end dinner party. The occasion was especially valuable as they served one of Malaysia's traditional cuisines — Sate — which is not easy to come by at a Korean restaurant in Seoul. Pop music by a group of Korean singers and expatriate Malaysian students now studying at Korean universities in Seoul added flavor to the year-end party.